DENIC, B. , PERIC, Z. , DESPOTOVIC, V.
This paper proposes a novel solution for coding of time varying signals with Laplacian distribution, which is based on delta modulation and three-level quantization. It upgrades the conventional scheme by introducing the quantizer with variable length code. Forward adaptive scheme is used, where the adaptation to the signal variance is performed on frame-by-frame basis. We employ configurations with simple fixed first-order predictor and switched first-order predictor utilizing correlation. Furthermore, we propose different methods for optimizing predictor coefficients. The configurations are tested on speech signal and compared to an adaptive two-level and four-level delta modulation, showing that proposed three-level delta modulation offers performance comparable to a four-level baseline with significant savings in bit rate. J. Jensen, I. Batina, R. C. Hendriks, R. Heusdens, "A study of the distribution of time-domain speech samples and discrete fourier coefficients," in Proc. IEEE First BENELUX/DSP Valley Signal Processing Symposium, 2005, pp. 155-158. N. S. Jayant, P. Noll, Digital Coding of Waveforms. New Jersey, Prentice Hall, Chapter 4, pp. 115-188, Chapter 8, pp. 372-417, 1984. K. Sayood, Introduction to Data Compression. San Francisco, Elsevier Science, Chapter 9, pp. 227-270, 2005. W. C. Chu, Speech Coding Algorithms: Foundation and Evolution of Standardized Coders. John Wiley & Sons, New Jersey, Chapter 5, pp. 143-158, 2003. D. G. Zrilic, Circuits and Systems Based on Delta Modulation. Springer, Chapter 1, pp. 1-27, 2005. J. D. Gibson, "Speech compression," Information, vol. 7, no. 32, pp. 1-22, 2016. Z. Peric, B. Denic, V. Despotovic, "Delta modulation system with a limited error propagation" in Proc. XIII International Conference SAUM, Nis, Serbia, 2016. 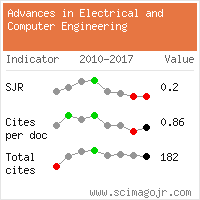 S. Tomic, Z. Peric, J. Nikolic, "Modified BTC algorithm for audio Signal Coding," Advances in Electrical and Computer Engineering, vol. 16, no. 4, pp. 31-38, 2016. H. Zheng, Z. Lu, "Research and design of a 2-bit delta modulator encoder/decoder," in Proc. 24th Chinese Control and Decision Conf. (CCDC), Taiyuan, 2012. E. A. Prosalentis, G. S. Tombras, "2-bit adaptive delta modulation system with improved performance," EURASIP Journal on Advances in Signal Processing, Article ID 16286, 2007. M. Lewandowski, "A short-term analysis of a digital sigma-delta modulator with a nonstationary audio signals," in Proc. International AES Convention, Warsaw, 2015. T. Ziquan, Y. Shaojun, J. Yueming, D. Naiying, "The design of a multi-bit quantization sigma-delta modulator," International Journal of Signal Processing, Image Processing and Pattern Recognition, vol. 6, no. 5, pp. 265-274, 2013. C. Canudas De Wit, J. Jaglin, C. Siclet, "Energy-aware 3-level coding and control co-design for sensor network systems," in Proc. IEEE International Conference on Control Applications, Singapore, 2007, pp. 1012 - 1017. M. Azarbad, A. Ebrahimzadeh, "ECG compression using the three-level quantization and wavelet transform," International Journal of Computer Applications, vol. 59, no. 1, pp. 28-38, 2012. Z. 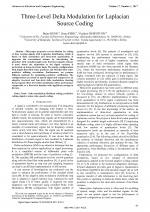 A. Sadik, J. P. OShea, "Realization of ternary sigma-delta modulated arithmetic processing modules," EURASIP Journal on Advances in Signal Processing, vol. 6, no. 5, pp. 665-676, 2009. M. Dincic, Z. Peric, "Design of quantizers with Huffman coding for Laplacian source," Elecrtonika IR Electrotechnika, vol. 106, no. 10, pp. 129-132, 2010. J. Nikolic, Z. Peric, "Lloyd-Max's algorithm implementation in speech coding algorithm based on forward adaptive technique," Informatica, vol. 19, no. 2, pp. 255-270, 2008. A. Ortega, M. Vetterly, "Adaptive scalar quantization without side information," IEEE Trans. on Image Processing, vol. 6, no. 5, pp. 665-676, 1997. V. Despotovic, Z. Peric, L. Velimirovic, V. Delic, "DPCM with forward gain-adaptive quantizer and simple switched predictor for high quality speech signals," Advances in Electrical and Computer Engineering, vol. 10, no. 4, pp. 95-98, 2010. ITU-T, Recommendation P. 862: "Perceptual evaluation of speech quality (PESQ), an objective method for end-to-end speech quality assessment of narrowband telephone networks and speech codecs", 2001. J. D. Gibson, Y. Y. Li, "Rate distortion performance for wideband speech," in Proc. Information Theory and Applications Workshop (ITA), San Diego, 2012, pp. 186-191. ITU-T, Recommendation G.722.1: "Low-complexity coding at 24 and 32kbit/s for hands-free operation in systems with low frame loss", 2005. D. Marco, D. Neuhoff, "Low resolution scalar quantization for Gaussian and Laplacian sources with absolute and squared distortion measures," Technical Report, 2006. ITU-T Recommendation P.862.2: "Wideband extension to recommendation P.862 for the assessment of wideband telephone networks and speech codecs", 2007. Citations for references updated on 2019-04-19 03:10 in 83 seconds.